Freeriders, Expert Skiers, Intermediates, Beginners, Snowboarders and Apres-Ski! Nestled in the valley at the feet of Mont Blanc, Chamonix is one place that every skier must visit - with the world's greatest lift-served vertical drop. Away from the slopes it is very lively all year round with numerous bars and restaurants. The next notable snow forecast for Chamonix is 6cm2in, expected on 24 April, with around 58cm23in forecast over the next 7 days. The French Ski Resort of Chamonix is part of the Ski Pass Mont Blanc area with access to 952km592 miles of downhill skiing, with 507 marked pistes, served by a total of 248 ski lifts. In addition to the skiing in Chamonix itself (152km94 miles of pisted ski runs), the appropriate ski Lift Pass will allow you to ski or snowboard in the other Ski Pass Mont Blanc ski resorts of Argentière, Combloux, Cordon, Le Tour, Les Contamines, Les Houches, Megève, Passy Plaine Joux and St Gervais Mont-Blanc. With ski lifts as high as 3,840m12,598ft, skiing and snowboarding is assured throughout the season. One of the few serious contenders for the title of World's Most Famous Ski Resort, Chamonix Mont Blanc (as the resort prefers to be known) has the world's biggest lift-served skiable vertical drop of 2807 metres ( 9209 feet ), and one of the world's longest runs through the Vallée Blanche at 22 km ( 13.7 miles ). Beyond these spectacular statistics is Chamonix's relatively undisputed status as the world's tough mountain sports capital, the subject of endless ski magazine reports each season from editors wishing to prove they descended between the glacial crevasses and lived to tell the tale! For lesser mortals there are plenty of on-piste kilometres to soak up, all dominated by the spectacular scenery of Mont Blanc, Western Europe's highest peak (and Europe's second highest after Mt Elbrus in Russia, although some dispute whether Elbrus is in Europe). Chamonix Mont Blanc itself is a lively town at the heart of the Chamonix Valley with its own character, reflecting the attitude of its residents and of most visitors; a true love of the mountains. The longest possible descent in Chamonix is 22km14 miles long and the most difficult run is the 'Grand Montets', which is 8km5 miles in length. Chamonix is a name synonymous with the best and most challenging in mountain sports world-wide and attracts the best professionals of skiing, snowboarding, climbing and other disciplines each season. It attracts an even greater number of enthusiasts of all mountain sports and the resort is keen to point out that you don't have to 'live for skiing' to enjoy what Chamonix has to offer: there are pisted trails for all standards. Although the different centres offer skiing for all levels of ability, it is the Freeride and Off-Piste that is the magnet; and there are immense areas for both. Advanced and Expert Skiers love the steeps and variety of off-piste descents that Les Grands Montets offers, whilst lower in the valley, the stations of Le Tour and Les Houches provide good skiing for Intermediates. The Grand Montets, above Argentière, is a major part of Chamonix's reputation as a serious skier's resort. The skiable descent possible is from 3275 metres to 1230 metres and the world's record vertical in one day was set here by Canadian Mark Jones, clocking up 51 descents - a vertical of 64,000 metres (210,000 feet). Of the other sectors, the Aiguille du Midi is perhaps the most legendary, providing access to the famous 22km off-piste descent through La Vallée Blanche. A mountain guide is required, as this is glaciated terrain and crevasses are an ever-present and dangerous hazard. Finally mention must be made of historic Le Brévent, where Chamonix's and one of the Alps' first real ski lifts was installed. The descent there is around 1500m. As with skiing, Chamonix is the world capital for serious boarders and, after introducing the world's first monoski in 1977, it was fitting that Europe's first 'board carved its way down the slopes of Chamonix in 1981 beneath the feet of Australian Paul Loxton. Rapidly finding favour, boards were soon descending slopes previously rated 'impossible' including 60 degree gullies. Bruno Gouvy 'boarded the famous Alpine trilogy of Matterhorn-Eiger-Grandes Jorasses in 1988 before taking on the north face of the Aiguille du Midi, the Aiguille Verte and the north face of Les Drus. Today France continues to push the boundaries of the sport, producing world champions like Jean-Baptiste Charlet (1994) and Karine Ruby (winner of a snowboarding gold medal at the 1998 Nagano Olympics), as well as Arno Adam ( ski extreme world champion). Chamonix's Snow Park, sponsored by Salomon and staging numerous competitions, is situated on Les Grands Montets. We don't currently have confirmed season dates for Chamonix. 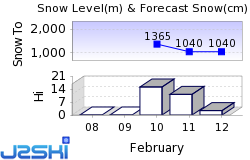 NOTE:- Lift and Piste openings are always subject to Snow Conditions in Chamonix. Chamonix is able to make snow, on 23km14 miles of ski runs, with 96 snow cannons. The 49 ski lifts of Chamonix are able to uplift 52,660 skiers and snowboarders every hour. Chamonix is in the French Alps in Ski Pass Mont Blanc, Haute-Savoie, France. The nearest airports to Chamonix are Sion, Geneva and Annecy. There are 10 airports within three hours drive. Annecy, Geneva and Sion are just one hours drive away, in good driving conditions, so you can be on the piste quickly. Chamonix is a very lively town, thanks largely to the international mix of mountain sports enthusiasts and the attitude of the local population. Snowboarding and skiing videos keep the white stuff coming well into the night for those who can't cope with leaving it up the mountain when the lifts close, then there is a range of bars, night clubs and discothèques open until dawn's light. Popular choices include the Ice Rock Caf‚ where someone parked most of a lorry in the basement, and Wild Wallabies, the Chamonix answer to St Anton's legendary Krazy Kangaruh hedonistic haven. Other night time possibilities include a full 10-pin bowling alley (8 computer checked lanes), a three screen cinema in the recently renovated Vox complex, and a casino attracting regular Italian, Swiss and International clientelle to the roulette and black jack tables. Chamonix's history has been traced to Bronze Age times and its current status was confirmed in a report as far back as 1751 when the locals were described as the most uncompromising men in Europe. Ten years before that Englishmen William Windham and Richard Pococke had been on the first recorded tourist trip, reaching the Mer de Glace. An historic ski and climbing town on the picturesque side of Mont Blanc, Chamonix is popular all year-round due both to mountain sports and its proximity to the Mont Blanc tunnel, which gives access through to the Aosta Valley, Italy and ski areas there such as Courmayeur. The first skis in the valley were spotted in 1893 and by 1907 one of the world first cable cars, 'Les Glaciers' was in operation (since removed). Six more were to follow between 1927 and 1963. The Mont Blanc Tunnel opened a few years later ensuring first rate access infrastructure in to the future. Chamonix staged the World's first Winter Olympics in 1924. Formerly one of the ski-bum meccas, Chamonix has matured and grown into a genuinely world-class centre for all mountain sports, winter and summer. Want to ask about skiing and snowboarding in Chamonix? Or contact Chamonix Tourist Office.